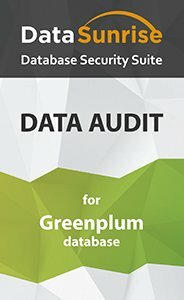 Greenplum database audit tool by DataSunrise. Database activity monitoring helps to control overall traffic flow inside the database. Audit creates the 24/7 log of all requests. It is useful to find the potential inner sources of data leaks. Employees, privileged users or any outside query are logged. Simple user-friendly interface. Self-learning feature that creates a list of typical SQL queries for given database, so that all other queries can be inspected more extensively. Greenplum audit tool by DataSunrise provides real-time visibility of all database activities, notifies about suspicious SQL queries, detects system malfunctions and software errors, reveals performance problems, potential security vulnerabilities and helps to prevent data leaks. Audit results are very important while detecting the malevolent user that caused data leak and evaluating the cost of the incident. Solution logs SQL codes of intercepted queries, database errors, target database information, including queries, authentication activity, privilege escalations, session duration time, IP addresses queries came from and other attributes. The utility supports Syslog protocol, thus it is compatible with SIEM-systems that are used to log security data and generate reports for compliance purposes. Our company’s aim is to create a multifunctional high-quality product that is maximal easy to deploy and to work with. Greenplum audit tool by DataSunrise is a great example of our operating principle’s result and it will be a reliable unit of your database security line.